These aspirations (short prayers) to the Sacred Heart of Jesus are a great way to practice a devotion quite dear to our Lord, that to His Sacred Heart. Devotion to our Lord’s Sacred Heart as described in more detail here, can be traced back to the 11th century, but it is from the private revelations Jesus gave St. Margaret Mary Alacoque in the 17th century that it took on its current form. A major component of this devotion consists of our paying tribute to Our Lord’s Sacred Heart in the Eucharist in Mass and in adoration before the Blessed Sacrament. A special part involves receiving Communion in a state of grace on the first Friday of nine consecutive months. In this devotion, we acknowledge Jesus’ burning love for us in a spirit of love and trust for Him, as well as in reparation for the many sins and coldness He has endured for fallen humanity. Would you like to draw closer to the Sacred Heart of Jesus, but feel pressed for time? Try praying some of these aspirations, which can be said anytime and anywhere. They’re easy to memorize. In the midst of the din and chaos of a busy schedule, even a moment of love directed towards our Lord and His Sacred Heart can go a long way! May the Sacred Heart of Jesus be loved everywhere. Sweet Heart of my Jesus, grant that I may always love You more. Sacred Heart of Jesus, I give myself to You through Mary. Sweetest Jesus, hide me in Your Sacred Heart. Do not permit me to be separated from You. Defend me from the evil foe. Heart of Jesus, burning with love for us, set our hearts on fire with love of You. Glory, love and thanksgiving be to the Sacred Heart of Jesus. Sweet Heart of Jesus, have mercy on us and on our erring brethren. All for You, most Sacred Heart of Jesus. Sacred Heart of Jesus, may you be known, loved, and imitated! 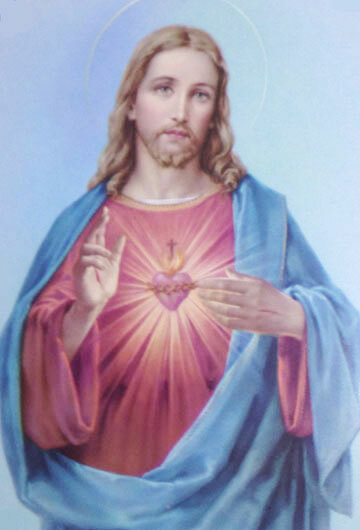 Sacred Heart of Jesus, convert all poor blasphemers. Most sweet Heart of Jesus, grant that peace, the fruit of justice and charity, may reign throughout the world. Jesus, life eternal in the bosom of the Father, life of souls made in Your own likeness, in the name of Your love reveal Your Heart and make it known. O Divine Heart of Jesus, convert sinners, save the dying, free the Holy Souls in Purgatory. Eucharistic Heart of Jesus, increase in us faith, hope, and charity.